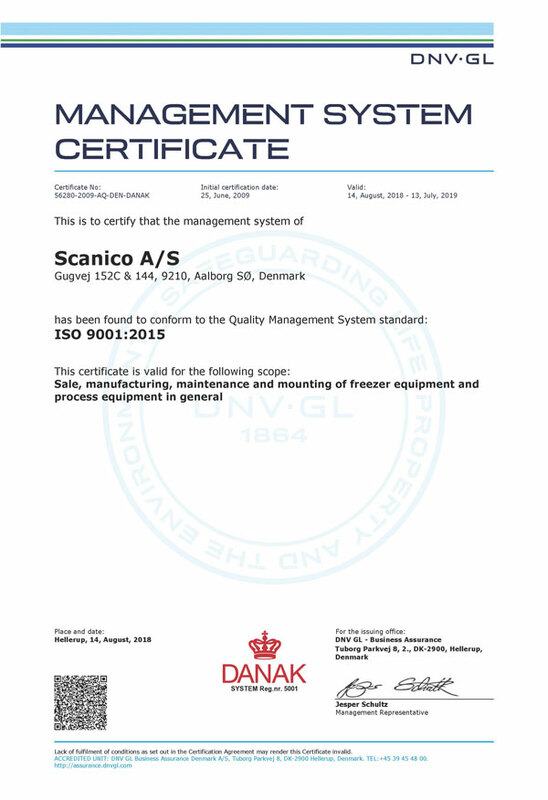 Scanico’s cooling and freezing solutions are known and respected by food manufacturers throughout the world. Since we began the development and production of stainless steel equipment for the food industry in Aalborg, Denmark, we have experienced a very encouraging year-on-year growth. Following the acquisition by The Middleby Corporation in December 2017, Scanico’s solutions have joined the food processing group within the comprehensive Middleby family of food service and food preparation equipment brands. Scanico A/S employs approx. 75 competent and experienced people. A large number of our employees have a higher technical education and/or many years of relevant industry experience, which guarantees a high degree of expertise in product and process development. Furthermore, Scanico has an experienced staff of engineers taking care of our installation and after-sales service worldwide. Our modern IT and production facilities provide optimum conditions for construction and production of our quality products. Due to experience and customer cooperation we can provide you with customized solutions that match the specific needs of every food-producing company. Focus on creating partnerships with our customers continuously increases our know-how. Each system is custom-made according to the specific nature of your products – ensuring that your products match the quality demands from your customers. Our engineers have a high level of expertise in product and process development. Our in-house project management makes it possible for us to complete projects according to agreed timetables, incorporating precise planning and cost control. And our dedicated workforce has the professional skills and expertise to see the projects through to completion. Scanico has always given high priority to research and development activities in order to find the best solutions to our customers’ needs. We invest a lot of time and effort in developing high-quality products and systems that improve and complement our customers’ manufacturing systems. These continuous efforts have resulted in a wide range of highly innovative products and solutions of which many are patented or patent pending. High quality ensures that our system is a reliable part of your production. By designing and constructing each system individually, our customer gets a reliable product guaranteed to stand up to the test of time. The product quality is ensured through our Quality Management System, ISO 9001. 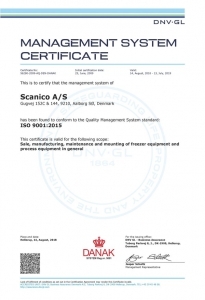 The quality management system is implemented throughout Scanico’s activities, as we are constantly striving to optimize our work processes and maintain focus on new quality goals for development and product quality. All Scanico lubricants (oil and grease) are registered in the NSF Nonfood Compounds Registration Program and comply with NSF International’s Registration Guidelines for Proprietary Substances and Nonfood Compounds, which cover applicable requirements of the FDA, USDA and EPA. Products complying with these requirements are identified in the online NSF White Book™ Listing of proprietary substances and non-food compounds. NSF Registration assures inspection officials and end users that the formulation meets appropriate food safety regulations. On December 7, 2017, The Middleby Corporation announced the acquisition of Scanico A/S. Scanico will become a member of the food processing group within The Middleby Corporation. All Scanico’s activities are still based in Aalborg, Denmark. The Freezer Division of Scanima A/S was transferred to a new company, Scanico A/S. The formation of Scanico A/S followed the acquisition by Tetra Laval of the Mixer assets of Scanima A/S. The Mixer Division of Scanima A/S is run under the name of Tetra Pak Scanima A/S from the existing site in Aalborg, Denmark. Holger Colding founded Scanima A/S, with a business philosophy based on development and manufacture of high-quality industrial freezing and mixing systems for the food, seafood, pharmaceutical and chemical industries. Holger Colding formed his first company, specialising in stainless steel solutions for the food industry.